Cauliflower originated in Cyprus and was introduced to France from Italy in the middle of the 16th century. Cauliflower is now grown throughout the world. China is the world’s largest producer of cauliflower, accounting for 44 percent of total production, followed by India with 29 percent of the world total. The third largest producer was Spain, accounting for 3 percent. One cup of cauliflower contains 3 grams of fiber which is 10% of your daily needs. Fiber feeds the healthy bacteria in your gut which reduces inflammation and promotes digestive health. Fiber may help to prevent digestive conditions such as IBD, constipation, and diverticulitis. Studies have found that diets that are high in fiber are linked with a lower risk of heart disease, diabetes, and some cancers. 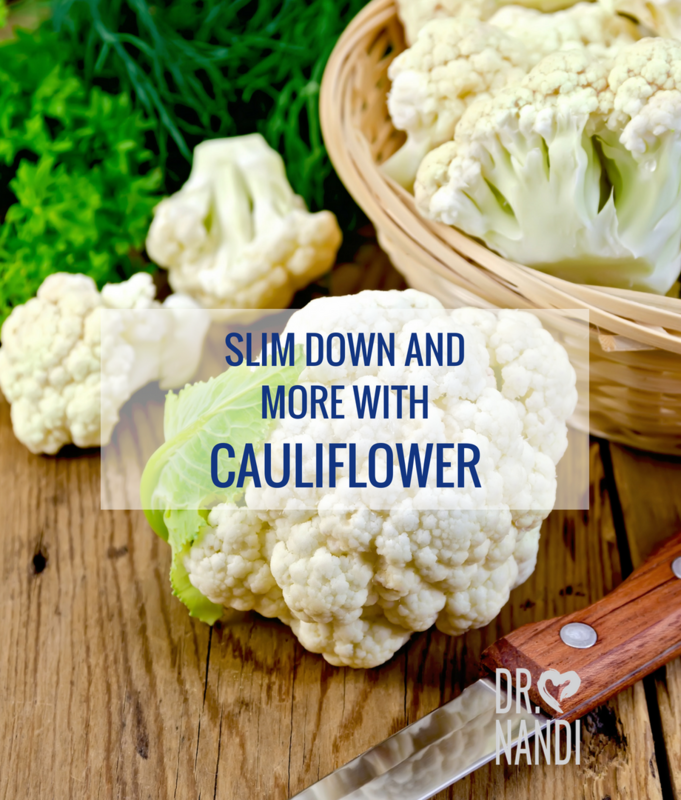 Cauliflower is low in calories and high in fiber. 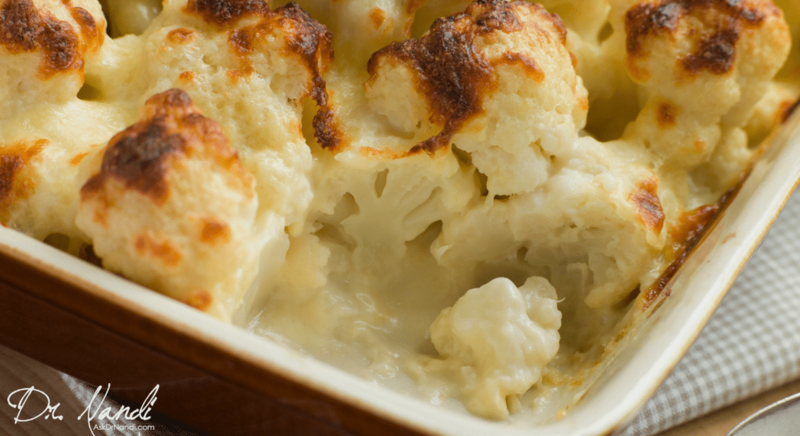 A single serving of cauliflower has 25 calories. 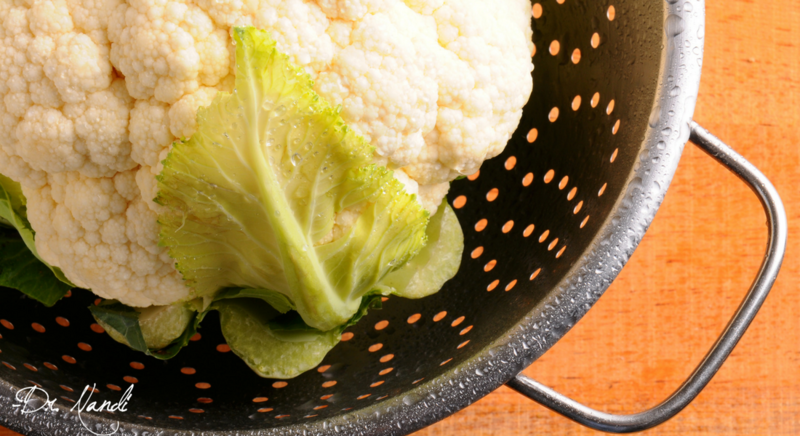 Cauliflower can be used as a substitute for higher calorie foods such as flour and rice. Fiber slows down digestion and helps to promote a feeling of fullness which may reduce calories consumed. Cauliflower contains a high water content; 92% of its weight is from water and nutritionists suggest that foods like cauliflower can help people feel full longer. Cauliflower is a great source of glucosinolates and isothiocyanates. These two groups of antioxidants are associated with slowing down the growth of cancer cells. Both have shown promising results in studies to help protect against colon, lung, prostate and breast cancer. Cauliflower contains carotenoid and flavonoid antioxidants as well. These antioxidants are known for their anti-cancer effects and have shown great results to help battle heart disease. One cup of cauliflower supplies nearly 11% for women and 8% for men of the suggested daily allowance of choline. Choline plays a major role in maintaining the integrity of cell membranes, synthesizing DNA and supporting metabolism. Studies have found that choline is important in brain development and the production of neurotransmitters. These are both important for a healthy nervous system. Choline has been found to help stop cholesterol from accumulating in the liver. Cauliflower contains the antioxidant sulforaphane. Studies are showing promising results that sulforaphane can stop or slow down the development of cancer by inhibiting enzymes that are involved in cancer and tumor growth. Some researchers believe that sulforaphane may have the ability to stop cancer growth by destroying cells that are already damaged. Scientists have found sulforaphane is most effective against colon and prostate cancer but has also been studied for its effects on many other cancers, such as breast, leukemia, pancreatic and melanoma. This easy to make #HealthHero Baked Cauliflower with Cheese Casserole is a great one to add to the list of family meals, it’s delicious! 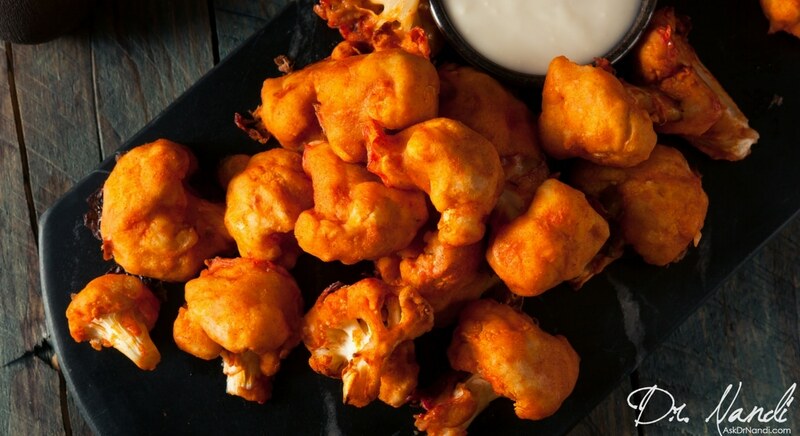 Dr. Nandi makes wings healthy with these Vegan Buffalo Cauliflower Wings. Perfect for every #HealthHero on everyday, especially game day!